Tonight's dinner was an arguably light and more arguably healthy dinner low in starch and high in fun. This is what I would serve the emperor of Japan if he were to come over for dinner. However, I have never cooked dinner for the emperor of Japan. I have cooked dinner for Hugo Chavez and Bill Clinton though. I don't really remember what they ate. It wasn't char. Let's face it, they're not really worth char. Char is for people decidedly more imperial. I marinated the char in lemon juice, olive oil, salt, and pepper and roasted it in the oven. I did the same with some eggplant coins (minus the lemon), and boiled some golden beets before tossing them in a little olive oil, butter, salt, and pepper. Then I sauteed the golden beet greens with some baby spinach, garlic, and olive oil. I'm a big fan of char. I know salmon is a little resentful because char only really showed up (in this country) about ten years ago and started eating its lunch. 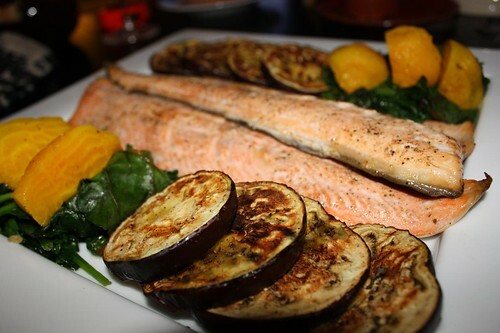 Salmon are notoriously bitter and resentful fish who would stab a trout or grouper in the back simply to be able to work their way onto your plate. They're just sour because they missed their opportunity to be eaten by Hugo Chavez.